Since 2013 when I first wrote about the A.D. Rattray Panama rum from Don Jose, the lack of any real effort by Panamanian rum makers like Origines or Varela Hermanos (among others) to go full proof, issue single barrel, well-aged, or year-vintage bottlings has made me lose a lot of my initial appreciation for that country’s rums and I don’t seek them out with the enthusiasm of previous years. There’s just too much mystery and obfuscation going on with Panamanian distillate, and other rums which crossed my path more recently, like the Malecon 1979, Canalero, and Ron Maja were relative disappointments. That leaves the independents to carry the flag and showcase some potential, and there aren’t many of those, compared to the tanker-loads of juice coming to the market from Jamaica, Guyana or Barbados. One of the last I tried was Dirk Becker’s Rum Club Private Selection Panamanian 15 year old issued in 2016 (it hailed from Don Pancho’s PILSA facilities), which I thought gave the country’s rums a much needed shot in the arm and showed that a rum aged for fifteen years and bottled north of 50% was a really good product. That same year I tried this one: Christian Nagel’s 11 year old rum which was sourced from Varela Hermanos (home of Abuelo), distilled on a column still in May 2004, aged in Panama and then bottled at 52.7% in Germany in June 2015 — and came with an outturn of a measly 247 bottles. 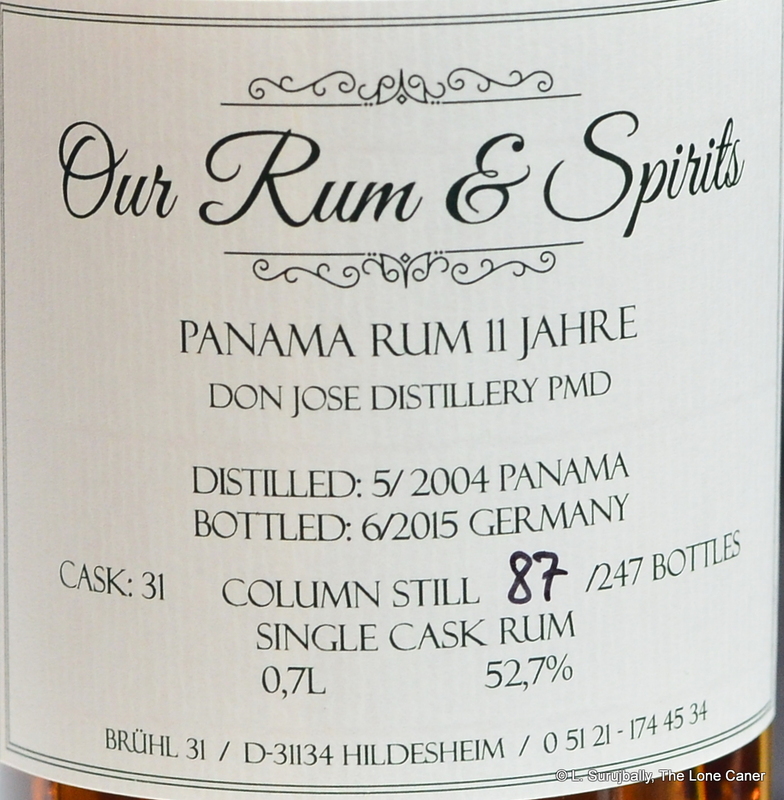 Like Rum Club’s offering, it wasn’t bad, being a solidly built piece of work, light in the manner of the Panamanians generally, the strength adding more intensity to the profile. There was a clear sort of white wine fruitiness on the nose – pineapples, pears, some tartness, a little caramel – wound around with a thread of citrus, all in a very good balance. To call it “easy” might be to undersell it – it edged towards the crispness of a dry Riesling without ever stepping over and that made it a very good experience to smell. There’s nothing to whinge about the palate: it started out with the big players of lemon peel, caramel, and vanilla, with some spiciness of oak well under control. It feels and tastes a mite heavy, somewhat sweet, which suggesting some dosing — however, I was unable to confirm this, and neither was the bottler, Christian Nagel, who was emphatic that he himself had added nothing and expressed his frustration to me at his inability to find an unmessed-with rum from Panama, or a rum where the chain of production-evidence is clear and unambiguous. The finish was short and a little sweet, with crisp fruitiness, more lemon peel, pears, and cherries, all very low key and over quickly. 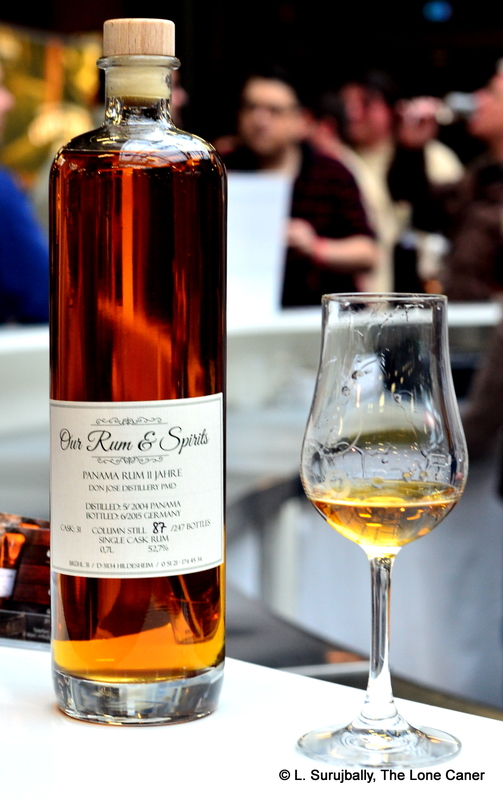 Christian Nagel, who founded Our Rum & Spirits, is not exactly an independent bottler in the normal sense of the word (or, he didn’t start out that way back in 2014 when he bottled his first one), because the rum business is, for him, a sideshow to his restaurant which serves rums as part of the menu. Yet he keeps cropping up at the Berlin Rumfest, and has multiple bottlings from Guyana, Barbados, Panama and Jamaica, and in 2017 carted off a few medals to add to his stash and burnish his reputation as someone who knows how to pick his casks….so my opinion is that he’s becoming more of a bottler than he started out as, which is good for all of us. Overall, the rum presented as perfectly serviceable, very drinkable, but I felt it lacked originality and real top-notch quality. Certainly cask strength Panamanian rums like this one are a step above the wussy forty percenters which corner the market in North America, because by being that way they are more assertive, and allow smells and tastes to be more clearly defined and appreciated. So they are, overall, somewhat better. Still, when it comes right down to it they continue to lack…well, adventure, character. A particular kind of oomph. I always get the impression the distillers are stuck in the fifties, when light Spanish column-still distillate was the rum profile du jour. When one considers the rip-snorting island products coming off the estates these days, the mad-scientist ester-squirting power bombs that get issued, each racing to see which can be more original, Panamanians just fizzle. This one is better than most, but it still doesn’t entirely make me rush to go out and buy a whole raft more.